1. Emile Edouard Charles Antoine Zola was born in April 1840 in Paris. He was a French writer, an exemplar of the naturalist school, but this blog will concentrate on the reason why an Israeli street is named for this non-Jew who never set foot in Palestine. 2. Captain Alfred Dreyfus, a French artillery officer, one of the army’s General Staff, was a Jew. When French intelligence discovered evidence of military secrets being smuggled to the Germans, Dreyfus was accused, court-martialed, convicted of treason, and sentenced to life-long penal servitude on Devil’s Island in French Guiana. At the court-martial, Dreyfus was not permitted to examine the evidence against him. A handwriting expert testified that the very lack of resemblance between Dreyfus’ handwriting and the document in question was evidence that he had written it. 3. Dreyfus was publicly humiliated, his insignia torn off and his sword broken in half; he was marched around the parade grounds as the crowd spat at him and cried out “Jew” and “Judas.” Herzl, a young newspaperman at the time, was present, and the experience crystallized his conviction that Jews had no secure home in all of Europe. 4. When evidence emerged that the real culprit was another officer, Ferdinand Esterhazy, a military cover-up ensued. The issue was raised in the French Senate, but the government refused to consider new evidence in the case. Esterhazy was tried, but acquitted. 6. Zola’s intention was to be prosecuted for libel so that new evidence could be brought and made public. His letter was to prove the turning point in the case; because of his stature among the intelligentsia, his stand was enormously influential, both in France and abroad. 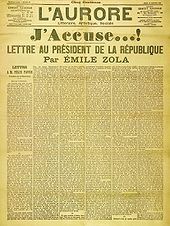 Zola was brought to trial for criminal libel on February 7, 1898, convicted on February 23, and removed from the Legion of Honor. 9. Zola did not live to see this happy conclusion. He died in September 1902 of carbon monoxide poisoning due to a blocked chimney. Thousands attended his funeral, at which he was eulogized by Anatole France as not just a great man, but “a moment in the human conscience.” Suspicion remains to this day that the blocked chimney was deliberate, a murder by an anti-Dreyfusard. 10. For an excellent article summing up the ins and outs of the case, see Adam Gopnik’s “Trial of the Century: Revisiting the Dreyfus Affair,” published in The New Yorker of September 28, 2009. 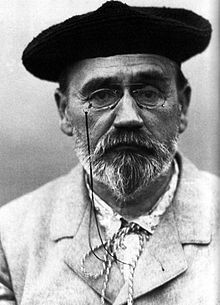 It should also be noted that in 1998, on the hundredth anniversary of Zola’s statement, France’s Roman Catholic daily, La Croix, apologized for its anti-Semitic articles during the Dreyfus Affair. In Tel Aviv, you’ll find Emile Zola Street just west of Dizengoff and south of Ben Gurion. 1. Moshe Dayan was a military leader who played key roles in four wars–and then worked effectively for peace. He was a sabra, born May 1915, the second child born on the first kibbutz to be established in Palestine, Kibbutz Degania Alef, near the shores of Lake Kinneret. His parents were immigrants from Ukraine. They moved to Nahalal, the first moshav, when Dayan was young; he attended agricultural school there. 2. His career as a warrior began in 1929, when he joined the newly formed Haganah at age fourteen to help guard Jewish settlements. During 1936-9, he was with the special police force in the Jezreel Valley and Galilee. In 1938, he joined the Palestine Supernumerary Police, serving under Orde Wingate in the Special Night Squad operations [see my post of March 12]. In October 1939 he was imprisoned in Acre along with other Haganah members, serving a ten-year sentence; all of them were released in 1941 after intervention by Chaim Weizmann. He then served in a small Australian-Palmach-Arab reconnaissance task force, infiltrating Vichy French Lebanon in preparation for an Allied invasion. It was there, in 1941, that he was shot by a sniper who had caught the glint from the binoculars he was using; he lost his eye and extraocular muscles. 3. Following the war, he made his way quickly up the ladder, appointed to the Haganah general staff in 1947 to work on Arab affairs, including espionage and distribution of abandoned Arab property. In 1948, commanding the Jordan Valley sector, he stopped the Syrian advance. He was first commander of the 89th Battalion, appointed June 1948, and in July of that year became Military Commander of the Jewish-controlled areas of Jerusalem. He was a controversial figure, narrowly escaping court-martial a number of times for disobeying orders. Nonetheless, by October 1949 he was promoted to Major-General and made head of the Southern Command, replacing Yigal Allon [see my post of March 12], much to the dismay of the officers, many of whom resigned. To curb Palestinian infiltration of the borders, he instituted harsh policies, including strafing, raids, mines, and “collective punishment,” against the Arabs by harassing nearby villages and bedouin camps. He considered this policy effective, though not justified or moral. The Arabs were hostile, and he considered terrorism as a stage of war, a way of gaining time while they built up their military strength. 4. In May 1952, after attending a British Army Officer school, he was appointed Operational Commander of the Northern Command; seven months later, Head of Operations (G) Branch, the second-most senior position on the General Staff. A year later, he became Chief of Staff. He reorganized the army, strengthening combat units, revamping mobilization plans, starting a military academy for officers, and emphasizing air force capability. Over the next several years he approved a number of cross-border operations in which civilians were killed. Having carried out operations to instigate an attack by Egypt, in 1956, during the Suez Crisis, he commanded the Israeli forces fighting in the Sinai. He retired from the IDF in 1958. 5. The following year, 1959, he joined the Mapai party and was elected to the Knesset for the first time. He served as Minister of Agriculture from 1959-64. In 1965, with those loyal to Ben-Gurion [see my post of 10/9/13] he formed the Rafi (Alliance of Israel’s Workers) party. He served as Defense Minister (1967-74) and later Foreign Minister (1977-79). 6. During the Six-Day War (1967), he oversaw the capture of East Jerusalem. He was hawkish and did not want to return the occupied territories. A popular hero at that time, he was blamed in 1973 for the ill-preparedness of the IDF at the start of the Yom Kippur War – and for his negative view of Israel’s chance of success following the losses of the first two days. David accords were agreed upon and signed, and the peace agreement with Egypt was a reality. At the end of his life, he advocated unilateral disengagement from the occupied territories. 10. His published works include: Diary of the Sinai Campaign, Living With the Bible: A Warrior’s Relationship with the Land of his Forebears, Story of My Life, and “Breakthrough: A Personal Account of the Egypt-Israel Negotiations. 11. Suffering from cancer, he died of a massive heart attack in October 1981 in Tel Aviv. He was buried in Nahalal cemetery. 12. In 2005, Dayan was voted seventy-third on the list of greatest Israelis of all time. In the Tel Aviv area, you’ll find Moshe Dayyan Street east of, and parallel to, the Ayalon River, and south of Derech HaShalom. 1. His father had made aliyah in 1890, and he was born Yigal Pelkowitz (or Palcovitch) at Kfar Tavor in the lower Galilee in October 1918. Shortly after graduating from Kadoorie Agricultural High School in 1937, he became one of the founders of Kibbutz Ginosar, also in Galilee. 2. During the Arab revolt of 1936-9, he commanded a field unit of the Haganah and then a mobil patrol. He was part of a hand-picked unit that included Moshe Dayan, working alongside the British in the counter-insurgent Special Night Squads under Captain Orde Wingate, who taught and favored ruthless tactics. 3. World War II broke out. In 1941, Allon became one of the founding members of the Palmach, the elite strike force of the Haganah. In 1941-2, he was a scout with the British forces against the Vichy French in Syria and Lebanon. 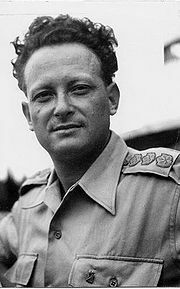 In 1945, he became Commander-in-Chief of the Palmach. In 1947, he approved an attack on the village of al Khisar in which homes were destroyed and civilians killed. 4. In June 1948, following the establishment of the State of Israel, he commanded the troops ordered to shell the vessel Altalena in Ben-Gurion’s confrontation with the Irgun. 5. That same year, in the Israeli War of Independence, Allon led several operations on all three fronts – the Galilee, the Center and the Negev – driving out the invading Arab armies and capturing many prisoners of war. He retired from active service in 1950. 6. He studied at the Hebrew University and at St. Anthony’s College, Oxford, reading philosophy and history. 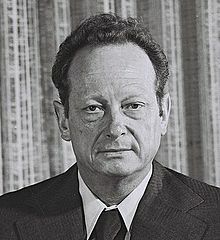 He became prominent in the Ahdut HaAvodah (Labor Unity) party and in 1955 was elected for the first time to the Knesset. He was to serve until his death twenty-five years later. 7. He held many prominent portfolios in the cabinets of David Ben-Gurion, Levi Eshkol and Golda Meir. From 1961-7 he served as Minister of Labor; from 1967-9, Deputy Prime Minister and Minister of Immigrant Absorption; interim Prime Minister, briefly, in February-March, 1969; Deputy Prime Minister and Minister of Education and Culture, 1969-74; Minister of Foreign Affairs, 1974-77. 8. He was the architect of the Allon Plan, a proposal to end the Israeli occupation of the West Bank by negotiated partition of the territories between Israel and the Hashemite Kingdom of Jordan, plus a Druze state on the Golan Heights. The plan was presented to the cabinet in July 1967, at the end of the Six-Day War. It was not accepted by Jordan’s King Hussein. 9. In 1974, he served as a member of the Israeli delegation to the separation-of-forces agreements signed with Egypt and Syria. 10. He was Chairman of the World Labor Zionist movement from 1978-80. 12. He died unexpectedly of heart failure in February 1980. His funeral was attended by tens of thousands of mourners. President Yitzhak Navon said in his eulogy that Allon dedicated himself to three matters: Israel’s quest for a just, secure peace with its neighbors; strengthening ties with diaspora Jewry; and finding new paths for Israeli youth. He was buried on the shore of Lake Kinneret in the cemetery of Kibbutz Ginosar, where there is a museum named in his memory. In Tel Aviv, you’ll find Yigal Allon Street just east of the Ayalon River, running north-south in the vicinity of Derech HaShalom. In Safed you’ll find the Yigal Allon Cultural Center, named in his memory. 1. He was born Benedito de Espinosa in Amsterdam in November 1632. The son of a successful merchant, he was raised in the Portuguese Sephardic community. He had a traditional Jewish upbringing, but his education was cut short at the age of seventeen, when his elder brother died and he went to work in the family business importing dried fruit. 2. He went on learning. He spoke Portuguese, Hebrew, Spanish and Dutch, and at age twenty began the study of Latin with a freethinking former Jesuit, Franciscus van den Enden, who probably introduced him to modern philosophy. Spinoza evidently taught himself medieval Jewish philosophy, Kabbalah and modern science. In 1654, when his father died, he began teaching at Van den Enden’s school and changed his name to Benedictus de Spinoza. He became friends with dissident Christians who rejected the authority of established churches. 3. After lengthy reflection, he concluded that the scriptures were not authored by Moses and that many prevailing dogmas of Judaism were wrong. In July 1656, at the age of twenty-three, he was exiled from the Jewish community by a cherem for his “evil ideas and acts,” his “abominable heresies” and “monstrous deeds.” Scholars believe he was teaching the ideas that he would soon publish – denying the immortality of the soul; rejecting the notion of a providential god; and claiming that the Law was not given by God. 4. His response to this censure was, “This does not force me to do anything I would not have done of my own accord, had I not been afraid of a scandal.” Attacked on the steps of the synagogue by a knife-wielding assailant, he wore his torn cloak for years afterward as a kind of badge of honor. 5. At about the same time, the importing business turned sour; he turned it over to his younger brother and devoted himself to optics and philosophy. He worked as a lens grinder, a profession that brought him into contact with prominent scientists and mathematicians involving him in optical investigations and the design of microscopes and telescopes. He lived simply, turning down rewards, honors, teaching positions and an inheritance. Though he associated with Christians, he never converted to Christianity. 6. Only two of his works were published in his lifetime: Descartes’ ‘Principles of Philosophy’ and Theologico-Political Treatise. The latter was written in defense of secular and constitutional government, in opposition to the Prince of Orange. It was published anonymously in Hamburg in 1670, but he was quickly identified. One of the prince’s supporters described the tractate as “forged in Hell by a renegade Jew and the Devil.” Spinoza kept writing, but stopped publishing. His other works include A Short Treatise on God, Man and His Well-Being, Treatise on the Improvement of Understanding and his great work, Ethics, which is dense and mathematical. His books were listed on the Catholic Church’s Index of Forbidden Books. 7. Is it any wonder that he wore a signet ring engraved with a rose and the Latin word “caute” (cautiously)? 8. His ideas laid the groundwork for the Enlightenment, modern biblical criticism and modern concepts of the self. In brief, he held that everything that exists is one substance, that God and Nature are two names for this same fundamental substance; that God exists, but is abstract and impersonal, having infinite attributes, some of which are not present in our world; that mind and body, too, are not separate (as Descartes held) but aspects of the same infinite substance; that the reality we experience comes from God, but being the ultimate and only substance, God cannot be prevailed upon by prayer or ritual to change anything. 9. It follows from this that everything that happens, happens of necessity, nothing by chance; that reality is perfection, and that our perception otherwise is because of our inadequate understanding – good and evil are relative and seen with regard to our limited human circumstances. The best human response to the world is to come to understand it better, the highest virtue being knowledge of God/Nature/Universe. 10. 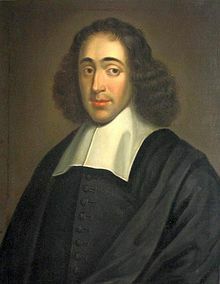 Spinoza identified three types of knowledge – opinion, reason and intuition. Intuition, he said, provides the greatest satisfaction; the more conscious we are of ourselves and Nature, the more blessed we are. This line of thought, of course, leads directly to modern psychology. 12. He died in February 1677 of lung disease, age forty-four, and is buried in the Hague in a Christian cemetery. 13. For more quotations by and about him, see en.wikiquote.org/wiki/Baruch_Spinoza. For more about his philosophy, go to this article by Steven Nadler at http://www.neh.gov/humanities/2013/septemberoctober/feature/why-spinoza-was-excommunicated. A 2008 play, “New Jerusalem” by David Ives is based on the cherem issued against Spinoza. In Tel Aviv, Spinoza Street runs north-south between Frischmann and Ben Gurion.